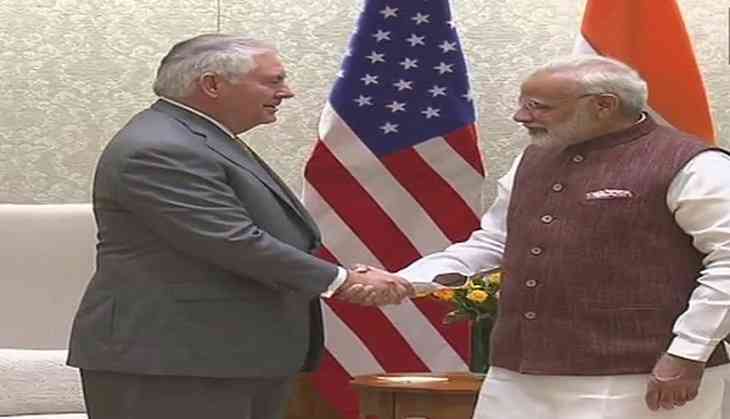 United States Secretary of State Rex Tillerson met Prime Minister Narendra Modi here on Wednesday. Earlier today, speaking at a joint press conference with External Affairs Minister Sushma Swaraj, Tillerson lauded India, saying: "India and the United States are natural allies. The two nations stand shoulder-to-shoulder against terrorism." While the U.S. Secretary of State criticised Pakistan for not acting against the terrorists operating within the country, Swaraj said, "The recent attacks in Afghanistan are a proof that safe havens and supporters of terrorism are active. Pakistan needs to act on this." Tillerson also said that they were putting in place a mechanism to deny terror outfits the ability to launch attacks against other countries. Tillerson said, "In my discussions in Islamabad, we were frank to conclude that there are too many terrorist outfits that find safe havens in Pakistan. We are putting in place a mechanism to deny these outfits the ability to launch attacks against other countries." The U.S. Secretary of State, who is on a two-day visit to India, yesterday made his inaugural trip to Pakistan, where he reiterated Trump's message that Islamabad must increase its efforts to eradicate the militants and terrorists operating within the country. "We want to work with Pakistan in a positive way as we think this is in their interest in the longer term," Tillerson said. 2.0: UAE PM Sheikh Mohammed bin Rashid Al Maktoum to grace the Rs. 12 crore audio launch of Rajinikanth, Akshay Kumar film? READ NEXT >> 2.0: UAE PM Sheikh Mohammed bin Rashid Al Maktoum to grace the Rs. 12 crore audio launch of Rajinikanth, Akshay Kumar film?